The African Literary Journals are here with bold integration of the indigenous to the criticism of literature. In spite of the cultural myopia of Western critics, the so-called minority nations may yet become major streams in the estuary of global cultures. Such imaginative approach to development issues being the cardinal point of IRCALC’s formation has informed the selection of presentations for B4 and 5 editions of the African literary journals. Here the onus on her literature to turn the searchlight on African thought is so striking that a great deal of entries have dwelt on Afrocentric aesthetics. But this is no less surprising when it is recalled that early recognition accorded writings from the continent had come from Africa-centred efforts of such foremost writers as Leopold Senghor, Laye Camara and Chinua Achebe. Reading further, the post colonial rhetoric continues with echoes of political commitment, being twin issues in African developmental discourse. And then the highpoint of the African re- imagining has been the overarching signification of the folk literatures of Africa in a manner of cultural celebration often taken by the West as belonging in the past but now surfacing with an energy that recognises the immediate relevance of this cherished but neglected part of literary culture. Nevertheless, in spite of the exuberance of research efforts, these journal collections can only whet the appetite for the imaginative chronicle of African aesthetic for past decades. 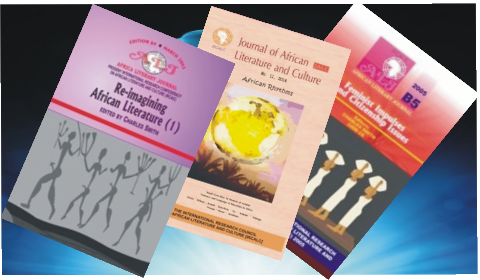 The African Literary Journal ALJ B5 sets the stage for future literary appreciation which studies the literary, social and political realities of developing nations. The exclusivity of disciplines of the early school appears to be replaced by a concept that anchors on the imaginative disciplinary relations where borders seem to merge in their treatment of contemporary issues whether feminism, or sexual discrimination, politics, nation building, literacy and culture. This volume of critical illuminations proves, against the backdrop of modern attitudes toward literatures coming from nations deemed “ethnic minorities,” that literature in Africa lives up to the rousing of esthetic imagination to form an active, refreshing part of world cultural discourse. Toward the imaginative approach to Africa’s development issues is the focus of IRCALCs B4 edition of the African Literary Journal. ALJ B4 comes with indigenous concerns for African literature. The so-called minority nations may yet become major streams in the estuary of global politics, say the editors in their preface to the journal volume. With the emphasis on African oral literatures, Mbunda and Ce review the birth songs of Cameroonian women performers and riddle contests of young artistes from Nigeria in a manner that recognises the immediate relevance of this greatly cherished but neglected part of African literary aesthetics. However, this edition may only whet the appetite for the imaginative chronicle of Africa’s progress in the last decade.